One of the first requirements for the Tenderfoot rank is to identify poisonous plants in the local area, which for us means Oregon and Washington. The Boy Scout handbook mentions three: Poison Ivy, Poison Oak, and Poison Sumac. However, this information is somewhat misleading, as only one of these plants is endemic to our area. The following is the guide for our area. Unfortunately, it is also very common and there are opportunities to find it on almost every campout. Like poison ivy, the leaves of poison oak (usually) occur in threes, hence the rule "leaves of three, let it be". Identification: Usually grows close to the ground, leaves occur in threes and have scalloped edges like oak leaves. At its peak, poison oak leaves are often distinguished by a sticky resin on top of the leaves but you cannot count on this. (The scout book also mentions white berries, but you almost never see them.) There are many plants that look similar to poison oak, but it is bad enough that you should just stay away from anything that even looks close. In the fall, poison oak leaves often turn bright red. Note that although poison oak is usually a low plant, it can climb other plants and even form large shrubs under the right growing conditions. Symptoms: Skin rash up to 48 hours later, immediately for those very sensitive. Treatment: Change clothes immediately and rinse or shower with large amounts of cool water to rinse off the poison as soon as it is discovered. Some sources advise against using soap. Keep clothes in a plastic bag to wash separately. Watch for allergic reaction. You can treat a rash with calamine lotion or a solution of baking soda and water. These will provide comfort but not actually cure the rash. This is a common plant in the woods. Fortunately, this plant is not very toxic, it's just irritating. The plant causes immediate and occasionally severe burning upon contact with the spines. Identification: Plants are commonly 3-4 feet high, leaves with toothed edges. The dstinguishing feature is that the undersides of the leaves (and usually the stems) are covered with tons of tiny, hollow needles or spines. Treatment: There's not much you can do except wait it out because the needles are so tiny. You can try removing needles with tape. Take aspirin or tylenol if necessary. Also called belladonna, this plant is not native to Oregon but can be found here frequently. Camp Ireland is rife with it. 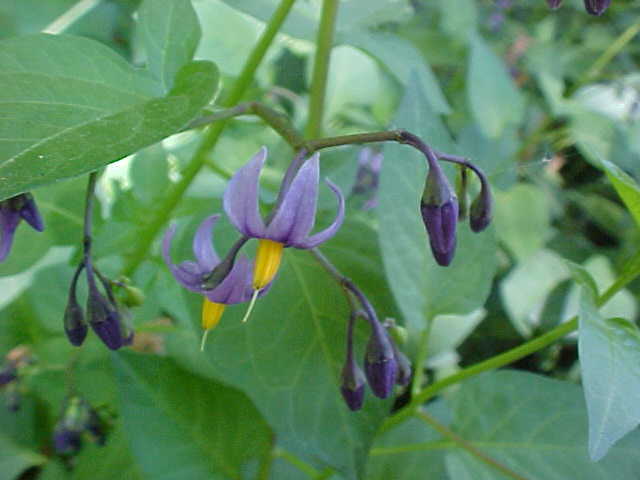 Identification: Very attractive purple and yellow flowers, in the late summer accompanied by brilliant red oblong fruit. The plant grows in shady areas and has a very distinctively bad smell. 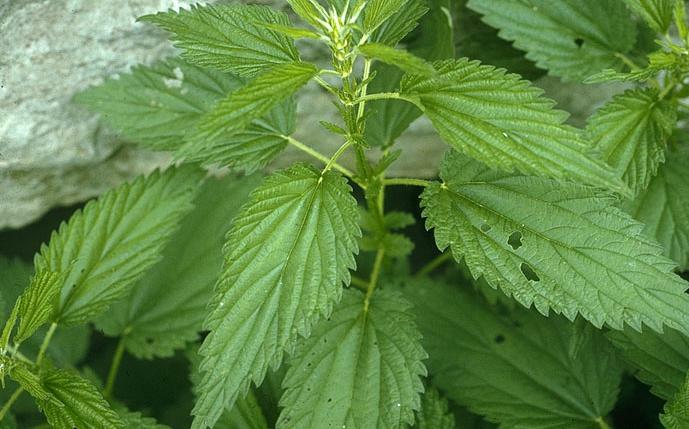 Treatment: It is unlikely that someone would actually eat the berries (due to the smell), but even touching any part of the plant will leave a poisonous reside on the hands. Do not force vomiting, drink plenty of water, wash hands thoroughly with soap, and seek treatment for poisoning. 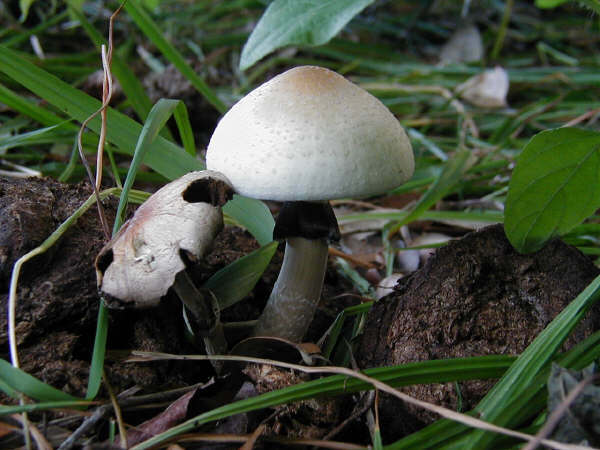 The are very many varieties of mushrooms, ranging from edible to deadly poisonous. The general rule is, don't eat or even touch mushrooms in the wild unless you are an expert. Identification: Mushrooms come in all sorts of shapes and colors, but commonly a cap on a stalk. Generally, spongy growth on dead vegetation. There is no foolproof rule to distinguish poisonous varieties from edible ones. Treatment: If eaten, drink water, rinse out mouth (but do not force vomiting). Wash any parts of the body that might have touched the mushroom. Collect a sample of the mushroom if possible. Call your local poison control center, seek treatment immediately.